On 5 April, a small but lively protest assembled opposite the Indonesian Embassy in London to object to the brutal military occupation of West Papua by Indonesia. 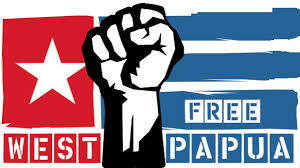 West Papua is the western half of the island whose eastern half is Papua New Guinea, an independent state. The Free West Papua Campaign which organised the protest, coinciding with other protests on the same date in the Netherlands and Australia, is calling for solidarity with a West Papuan boycott of the Indonesian presidential and assembly elections that will take place on 17 April. In May the US mining company Freeport McMoRan sacked 3,000 workers at the Grasberg copper and gold mine in West Papua, Indonesia. Workers had just begun a 30-day strike protesting against the company’s furlough policy — the temporary laying off of workers because of breaks in production. Following attacks in Paris and Beirut in November last year, along with the shooting down of a Russian passenger jet, Daesh has stepped up its deadly operations outside of the claimed borders of its “Caliphate” in Iraq and Syria. Students all over Europe — and, indeed, the world — are planning a wave of high-level direct action as part of the Global Week of Action, called by the “International Students Movement”. This movement, while originating as the initiative of a small number of activists based in Germany, has used the internet and social networking sites to create an impressive worldwide network of contacts that have responded to its calls for international action for free education. The former Indonesian dictator Suharto died on 27 January, without facing justice for the millions he killed or the wealth he appropriated during his 33 years in power. Suharto came to power in 1965, when he led a military coup to overthrow the nationalist Sukarno government. His first act was to physically exterminate the Indonesian Communist Party (PKI), having at least half a million of its members and supporters killed. His forces and Islamic militias eventually murdered perhaps two million opponents.